Part of Replogle's Heirloom Collection, the Logan Floor Globe is inspired by the fine craftsmanship of Italian furniture. Its larger scale and beautiful hand-rubbed wood base make it the focal point of any room. The aged brass full meridian complements the traditional color scheme and antiqued oceans. 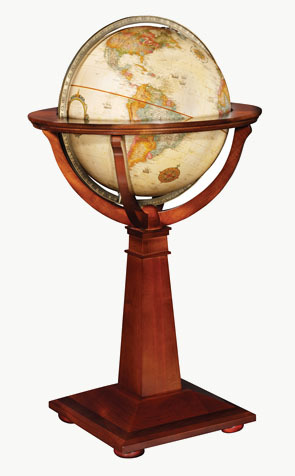 Replogle's Logan Floor Globe is backed by a one-year warranty.